As far as we’re concerned, arsenic is a killer, but microbes living in a world with very little oxygen almost three billion years ago used arsenic to get energy. International researchers have reported exciting new evidence that ancient microbes living in an oxygen-poor environment obtained their energy by transforming one chemical form of arsenic to another. The discovery draws on data collected at the Australian Synchrotron. In humans, arsenic inhibits a key enzyme in our cells that is involved in energy production. It is toxic in large doses, or if taken in small amounts over a long period of time. 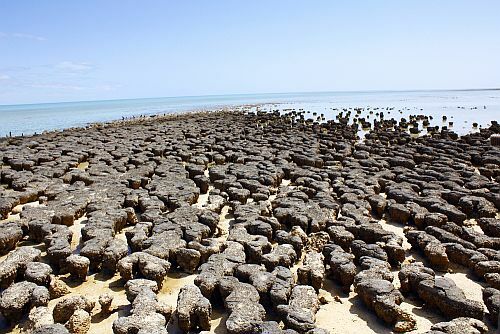 The team used several synchrotron facilities to investigate the chemistry of cell-like globules found in salt-encrusted portions of 2.72-billion-year-old fossil stromatolites from the Pilbara region of Western Australia. Their results provide evidence that arsenic cycling (involving arsenic-III oxidation and arsenic-V reduction) occurred in marine environments in the several hundred million years before the Earth’s atmosphere and shallow oceans became oxygenated. The visit successfully combined user experiments on geological samples with fruitful discussions on the ongoing development of beamline capabilities at the Australian Synchrotron and at Synchrotron Soleil in France, where the new Nanoscopium beamline will soon accept user experiments. Soleil synchrotron x-ray scientist Dr Andrea Somogyi described her visit as “an exciting interdisciplinary experiment and international scientific exchange”. With support from David Paterson (AS, XFM) and his team, Andrea and her colleagues returned home with more than 1 TB of data and “experience in the exploitation and interpretation of such large data sets”. Andrea and her colleagues also discussed beamline technology and design concepts with the XFM team and CSIRO. Their talks focussed on the different detector systems used at the AS (Maia detector) and Soleil (2D XPAD pixel detector), and ‘flyscan schemes’ that collect data on-the-fly rather than stopping at each step to measure the sample, which takes more time and is not very efficient. “It was very impressive to experience the significant development in fast continuous XRF and multi-technique measurements both at the AS and at Soleil due to the appearance of new state-of-the-art detector technologies, modern motion control and hardware environment,” Andrea said. Nanoscopium is a 155-metre-long, scanning, hard x-ray beamline that aims to reach down to 30 nanometres spatial resolution. It has two experimental stations that work consecutively, dedicated to coherent diffractive imaging and scanning x-ray nanoprobe techniques respectively.